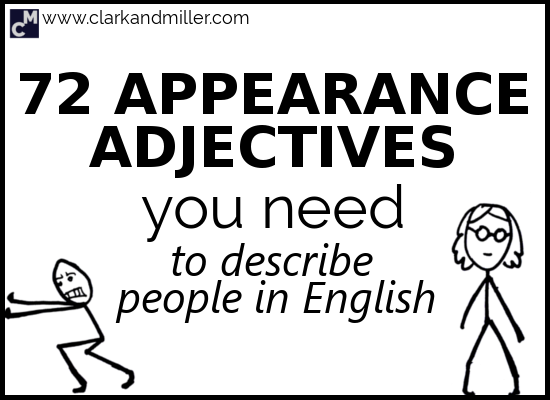 You’re about to learn 72 must-know appearance adjectives to describe how people look. For more adjectives, check out 59 Positive Personality Adjectives to Describe Your Favourite Friends. My question is: Can you describe them? I mean, really describe them, so that I could have a clear image in my head of what they look like — things like body shape, age, hair, etc.? If you want to do it well, describing people’s appearance in English can be tricky and requires a lot of detail. So today, let’s look at 72 adjectives to describe appearance in English. OK. Let’s start with some adjectives to describe someone’s general body shape. By the way, we have a few words for body shape: “figure,” “physique” and “build” are the most common ones. Maybe slightly fat but strong or solid looking. Usually quite short. Short with a wide body. You know how some men gain weight? They don’t just get fat everywhere — just the stomach. With a large body structure. We also use this adjective as a euphemism (a way of saying something negative indirectly). If you call someone big-boned, it’s usually just another way of saying that they’re fat. A little bit fat. Slightly overweight. But only a bit. Why do we have so many words for “chubby?” Maybe we just really like cherubs? Sometimes, it describes a woman with a thin waist and wide hips. But it’s nicer to say “curvy,” right? Or better yet, just don’t mention it. We usually use this to describe a part of someone’s body, not the person as a whole. So someone might have flabby arms or a flabby stomach. It means they have a lot of loose fat (or skin) that kind of shakes and wobbles when they move around. Thin, in a pretty or elegant kind of way. Tall and thin. But in an awkward kind of way. Very thin, possibly too thin. Like someone who doesn’t eat enough. You know those people who are so thin that it looks like they might break into pieces if they fall down? That’s slight. In English it also means “small,” but we tend to use it to describe short women. Someone with a lot of muscles. This is informal and usually used for men. Try to push him over. I bet you can’t. In good physical shape. Probably with visible muscle action going on. Imagine a wide person — one of those big guys or girls. What’s the big cliché of the gym? This is what I think of when I think of “ripped” — muscular and in good shape. And happy to show it off, probably. You know those tall, lanky people who never look comfortable? They move around looking uncomfortable. When they sit down, they look uncomfortable and awkward. Someone who walks around as if they’re walking through a low doorway — but all the time. The opposite of standing up straight. We have a lot of positive words for attractiveness. But look! Only three negative ones. I think that says a lot of good things about humans. You’d happily look at this person for hours if it wasn’t socially unacceptable. It’s like beautiful but usually for men. More masculine and manly. Grrr. Not as strong as beautiful, but still positive. Usually used for women (and my cat). Because there aren’t enough pictures of cats on the internet. Er… he (or she) looks … good. We actually often use this for things like kittens. That’s because kittens are cute. But we can also use “cute” to mean attractive. This is actually quite rude, so be careful with this one. But it’s there. And it’s used. We use it when we want to say that someone has nothing about them that’s attractive. They’re not ugly. Just … boring … plain … even forgettable. One of the things that really makes us look different from each other is that weird stuff that grows on the top of our heads: our hair! I mean, really think about it. Isn’t it strange that we have it? Remember — all of these are used to describe hair, not people. Not “He’s curly.” That just sounds very weird. So short that you almost look bald. But this time by choice. Because you shaved it off. Not bald. But you will be soon! Hair down to your shoulders. We can also have waist-length hair and even knee-length hair. Very thick, very curly hair in a rounded shape. Very popular in the 1970s, but I’ve noticed it’s becoming popular again. When you add gel to your hair. You know, that sticky stuff that you can use to style your hair. When you use gel or oil to comb your hair back. When you’ve divided the hair into two parts. You can have a centre parting or a side parting (or “part” in U.S. English). Maybe you don’t like your hair colour? Well, no problem — go out, buy some dye and dye your hair. You can have dyed green hair, dyed red hair or just dyed black hair. Or maybe you want something brighter? This is when you use peroxide to lighten it. Perhaps you don’t want to bleach all of it? Maybe you just want some of it bleached — in lines (or “streaks”). We have to face the truth! Sooner or later our hair goes grey. But that bit in the middle? When it’s half grey, half not grey? That’s a bit annoying. That’s greying hair. “Ginger” is a way of describing people with naturally orange (“red”) hair. But usually a euphemism for ginger. You know when someone hasn’t washed their hair for a long time? You run your fingers through it, and you need to wash your hands immediately. Hair that reflects lots of light. You know those unrealistically shiny people with unrealistically shiny teeth and unrealistically shiny hair on shampoo adverts? That. We can’t deny it. We’re all getting older. You know this, right? But when do you stop being young? This is quite subjective I guess. My answer is NEVER! This is a great way to describe someone who’s sort of young, but maybe hitting middle age. Hard to tell. Youngish! It surprises me how different everyone’s answers are to this. Personally, I think it’s 40. From 40, you’re middle-aged. There you go — I’ve just decided for everyone. But when does middle age end and “old” begin? I don’t know. You’ll have to ask someone older than me. It’s not very polite to describe people as “old.” So we invented this nice, polite, respectful word. There are a few adjectives to describe appearance that don’t really fit into any category, but I couldn’t just leave them out as they’re pretty useful. You know those red spots many unfortunate teenagers get on their face? Technically the condition is called acne, but we usually just say “spots.” I was one of those unfortunate teenagers. Without a beard. But for a guy, not a woman. We usually use this word to describe someone who has a noticeably large number of piercings. Someone with a lot of tattoos. Lots of hair! Everywhere! Even on the back and the back of the hands! Hooray! 72 adjectives to describe appearance! So let’s have fun with these. Think about your best friend. Done that? Good. Now tell me — what does (s)he look like? Answers in the comments! Best description gets a free virtual cake. Learning while having fun – thanks a bunch. I’m glad you found it fun and even happier you’re learning! Keep it up! Also, that is one of the coolest emojis I’ve seen. Nice one! I love the pictures and I really enjoyed reading it. If I hadn’t read this, I wouldn’t even know about mixed conditionals. Thank you so much! I wish I had got an English teacher like you when I was a student. That’s one of the nicest things someone could say to me. Thanks! Great visuals and very helpful, thank you! Keep doing more of the same! Gabriel, thanks so much for making things clear in such an amusing way)) And, we had a discussion with colleagues yesterday about the meaning of the question “How does he look?” Normally the question to ask about anybody’s appearance is “What does he/she look like?”. As far as I understand “How does he look?” is more about a persons condition – emotional (upset, tired, sad etc) or health condition, is it right? Can it also be asked about appearance? So, does the “How does he look?” question sound natural and what exactly does it mean? Thank you for your answer, Gabriel! I am making an art piece, and I needed a ton of negative thoughts and comments, thanks for the help, and good adjectives. This was really helpful and at the same time witty. Thank you so much, Gabriel.